What Are The Diseases That Are Spread By Birds And Bats? Most people who intend to get animal control when they notice bats and birds on their premises do so for aesthetic purposes. For instance, you may find that the presence of the pests increases the desecration of buildings, which becomes expensive to fix in case the droppings become excessive. Though this is a legitimate reason to get animal control services, there are other very important reasons why you should not allow too many bats and birds to inhabit your premises. This is a fungal disease that is most often caused by transmission of spores from bird and bat droppings. The spores are normally airborne, which means that even if the droppings are some distance away (such as in another part of your compound), you are still likely to get infected by them. Though the majority of illnesses caused by this fungus are mild, there are times when they can become more severe, and will manifest as a very high fever, pneumonia and even death. This is especially so if the individual who inhaled the spores had some form of immune compromise, and did not seek the right medical help in time. This is yet another fungal disease, and is usually caused by Cryptococcus neoformans. Most people who are healthy usually don’t get a severe illness when exposed to this fungus. However, in case of exposure to people who have weak immune systems, it could lead to a host of conditions including lung infections and spreading to other parts of the body. Examples of people who have depressed immune systems and who are likely to get this condition include those with diabetes, the very young and the very old, as well as people with HIV. Other common locations that the fungus can affect in addition to the lungs include the skin and the central nervous system. In addition to the above, the presence of bird and bat droppings in the home can also encourage the growth of other fungi. Remember, the droppings are usually very rich in organic matter, and often tend to have some moisture as well. This offers the perfect opportunity for mold to grow, and this will manifest as the presence of a musky smell in the home. As you can imagine, this can make your home a lot more uncomfortable than usual, and is something that should be avoided as much as possible. Rabies is a condition characterized by a viral infection that infects the central nervous system. Some of the manifestations of the condition include changes in mental status as well as muscle rigidity that can sometimes lead to difficulty in breathing. Bats are a very common cause of rabies infection, so if you notice them increasing in number in your premises then it might mean that you should get them exterminated. In addition to humans, rabies can also affect other animals. For instance, if you have a pet and the bat ends up biting it, it could get rabies and then transmit this to you and your family members. Most bats are usually infested with lots of ticks and mites as well. If these come into contact with you, you may end up suffering from a wide variety of illnesses depending on the nature of your immune system. If you are allergic to many things, for instance, you may notice that you get a very vigorous immune reaction towards bites by these pests. The presence of ticks and mites in your home can also be the source of embarrassment. For instance, if some of the mites get in your clothes, you may end up itching a lot when you wear these clothes. Most people might consider this to be a sign of poor hygiene, and your social standing might be reduced on account of this. As you can see, there are many health issues that are associated with bats and birds. If you happen to notice an increasing number of them in your home and are feeling uncomfortable about them, all you need to do is get quality animal control services. This will enable you to not only get rid of the problem, but also do so in such a manner that you will never have to worry about it again! What Are Your Options In The Prevention Of An Opossum Infestation? Opossums have the potential to cause some damage to a home as well as inflict any degree of injury to pets and people, especially if they feel stressed and cornered. Getting rid of them is therefore an excellent idea once you notice their presence. How you do this will have an influence on how much you spend on the venture. If you want to get rid of the opossums once and for all, it would be important to first get a qualified animal control specialist to get rid of them for you. Such parties are usually very skilled in pest removal, and will waste less time compared to when you try to remove the opossum on your own or get an unskilled animal control provider to do it. In many cases, opossums gain access to a home via the branches that overlie the home. By trimming these branches, you would reduce the chances of having to find another one in your home any time soon. Of course, there are other benefits of trimming the branches, including reduced roof damage and better aesthetics overall. The fact that it has so many other associated benefits means that trimming the branches should not be neglected. Having too many vents that are not protected around the home will result in the opossums gaining access through them to the home. Once you have gotten rid of the ones you have seen, you should then inspect the house thoroughly, taking note of any potential points of entry from the outside to the inside. These should then be sealed, such as by using mesh or a vent cover that allows air entry. The vents that are closer to the ground level are particularly important. Sealing them will not only protect your home from opossums, but also from other rodents and pests that are likely to crawl through the vents into the home. These pests tend to hide under decks, especially when there is enough space there. Unfortunately, there are times when they might die, and their decomposition will then result in a smell whose source you might not be able to identify. Protecting the bottom part of the deck is therefore important. This can be done by simply placing a metal barrier beneath the deck. Most opossums are attracted to environments in which there is a lot of food for them to thrive on. In fact, if you have a tendency of leaving a lot of food available for them, they might end up multiplying and causing even more of a problem later on. Measures such as making sure that your dust bins are emptied on a regular basis, and that they are always shut will go a long way in preventing such incidences. In the same vein, you could also eliminate any vegetation that might act as cover for the pests. This is as simple as mowing your lawn as well as trimming any large bushes. The beauty of doing this is that in addition to making your home less inviting for the opossums, it will also do the same for other kinds of pests and also make your home more beautiful in the process. These days, lights and sprinklers with motion sensors can be bought for relatively low prices. Investing in them can have a safety benefit, since it means that any burglars who walk into the compound will be scared off by the lights or sprinklers coming on. This can also act as a deterrent for the opossums, which will retreat every time the lights and sprinklers come on. The advantage of this deterrent is the fact that it’s usually not very labor intensive. As long as you have installed these devices in strategic places, you will not need to keep an eye on them. Some homemade remedies can be used as opossum repellants. These include making a mixture of molasses and dish soap, which is then squirted on some of the vegetation that the opossum might come into contact with. You can also substitute this with a mixture of something hot, such as pepper. The strategic placement of mothballs in the path of the opossums has also been found to work by some home owners in preventing opossums from infesting the home. Although some homemade remedies are “claimed” to be effective, we strongly urge you to make use of proper animal control services to curb an opossum infestation because this is the best way to get rid of them as well as prevent their recurring infestations. Assuming that you have noticed the presence of pests such as skunks and opossums in your home or compound, your next step might be to get a animal control expert to get rid of them for you. Trying to do this on your own is usually not advisable, since the success rates are usually not high, and you may end up having to deal with a recurrent problem in future. In addition to that, it might take too much time, and you may also expose yourself to various risks when doing this. In most cases, consulting a quality contractor is the best long term measure you can take. If you live in a rental property, you might need to call your landlord and talk to them about getting rid of the pests before going ahead and doing so. Remember, when you live in a rented house, it still belongs to the landlord. They therefore have the last say in what can and can’t be done in the home and compound. Making changes to the compound in the name of getting rid of pests can result in you facing numerous penalties, and you may also end up being evicted on account of breaking the rules. When consulting the landlord, you should give them an account of the problem, as well as when the pest removal experts will show up. In some cases, you can even negotiate the terms of pest removal. For instance, you can ask them to refund the cash later on, or at least make an equivalent deduction from your rent in the next payment cycle. If you happen to have pets such as dogs at home, they could interfere with the process of pest removal. Some of them might be very aggressive, and will try to bite the pest removal experts. Others may simply interfere with their work, and make it harder for them to complete it on time. In addition to that, you should also keep in mind that a few people are naturally afraid of pets such as dogs. Seeing a large dog running around, even if it’s usually very friendly, may be a bit disconcerting to them. Restraining it will help avoid most of these problems and help the contractors get on with their work faster. In a few cases, you might need to make an active effort to improve access to the part of the house that needs attention. For instance, if you have raccoons in your backyard or your attic, it would be wise to get rid of anything that might restrict movement to this part of the home. This way, when the exterminators come, they will have a much easier time getting to the heart of the problem and then getting rid of it. You should make arrangements to have an adult in the house by the time the pest exterminators come to get rid of the pests. Remember, they will need someone to receive them and tell them more about the nature of the problem if need be. Having an adult do this is the most reliable way of making sure that the correct information is passed to them, and adequate supervision is provided if this is needed. Of course, there are times when this might not be extremely important. For instance, if you had communicated with the contractor before and agreed on what they should do, you could even leave someone who does not know much about the problem in the house for security’s sake. They don’t need to know every little detail about the pest problem. Depending on the nature of the pests you are trying to get rid of, you might also want to put measures in place to get rid of any residue from the animal removal process. For instance, if pesticides are used, it would be a good idea to get a specialized cleaning service to clean the home before you can inhabit it again. This is especially so if you happen to have kids, who may be susceptible to ingesting the animal control products and also becoming harmed by it. Of course, if you use services from a responsible service provider, they are likely to do as much as they can to ensure that they don’t leave your home in a state that is likely to harm the members of your household. • The use of inhumane methods of killing pests: in most parts of the western world, killing pests in an inhumane manner is not allowed. This normally includes using methods that will mutilate the pest and those that will cause a lot of pain in the pest before killing it. If you are interested in buying devices such as traps for animal control, making sure that they are certified to be humane is important in order to ensure that this does not become a problem for you. When looking for a animal control expert to do the job for you, you should also make sure that they use humane methods of animal control. • Whether or not you are allowed to kill certain pests: in addition to that, it’s also important to note that in some parts of the world, you might not be allowed to kill some of the pests at all. This is especially so if it has been determined that the pests are endangered species, in which case killing them indiscriminately could result in their extinction. If it turns out that some types of pests cannot be killed by law, there are usually provisions describing how they can best be gotten rid of. For instance, some laws in a few countries stipulate that some of the pests be taken to shelters and zoos, and that some be released to the wild. It’s important that such legal guidelines be understood and followed in the process of pest removal in order to ensure that no problems are encountered. One important part of pest removal is preventing them from infesting the property again in future. This is an important step since it reduces the hassle of having to call a contractor to come and do the work all over again. One of the strategies that are usually employed in an effort to keep properties free of any pests is through the use of deterrents, which can either be physical or chemical. In most parts of the western world, there are laws that stipulate what you can and can’t use as deterrents for pests such as birds. Making sure that you understand them will help you steer clear of any legal issues. If you happen to live on rented property, simply going out and getting a contractor to come and get rid of pests might contravene your lease. You may end up being penalized for this, and since the lease is a legal document then it can be used against you in a court of law. For this reason, it’s always a good idea to clear the issue with the landlord before you proceed with finding a animal control expert. This has the potential to save you potential legal problems. Will you need to notify any parties? Another issue that can be considered legal in terms of animal control is if you need to notify any parties of the process. For instance, if you live in an apartment complex and are interested in getting rid of any pests, chances are that you may not find it easy to simply get a animal control expert and ask them to get rid of the pests for you. You might need to first notify other parties including your neighbors. This is especially so if the process is likely to cause some inconvenience. In most neighborhoods, it’s also a rule that any resident who might want to get such a project undertaken would give notice to the rest in due time. In summary, there are many legal issues that surround animal control, and these are likely to increase in future. Making sure that you work with an exterminator who is very good at their job is essential in making sure that all the above are addressed. Raccoon Problem Should Get Rid Of As Soon As You Notice Them? 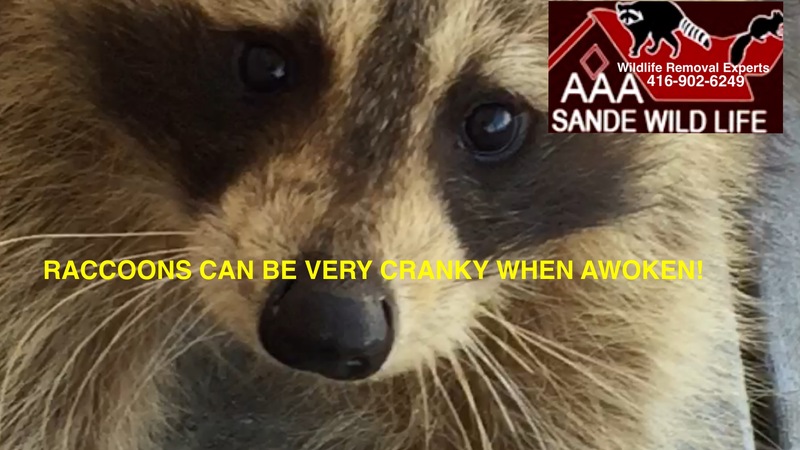 Contact The Raccoon Problem Solvers At AAA Sande Wildlife Control. If you happen to have pets in the home, the presence of raccoons can also present a few problems to you. The most obvious of these is when the pets end up getting injured by the Raccoons. This is especially so if the pets are inquisitive, and are left free to roam such that they end up coming into contact with the raccoons. Though there are very few incidences of death arising from this, the fact that your pet might be injured is often enough reason to get a professional to get rid of them as soon as possible. In addition to that, they can also transmit parasites to the pets as well. Common Raccoon problem include Rabies, Distemper, Roundworm as well as fleas and ticks. As you can imagine, the fact that your pets will be in contact with you and your kids means that if they get such infestations, they can also spread them to you and your kids as well. The cost of recurrent treatment of the pest infestation for your kids as well as for the pets is not only expensive, but can also waste a lot of your time as well. The pests can also cause direct harm to adults and children as well. The commonest way in which this occurs is when they are agitated, and when they feel threatened. In such cases, they can bite and scratch. In the process of doing so, one might acquire various infections including bacterial and parasitic ones. Rabies is a particularly scary disease to get when one is bitten by the raccoon, and is something that needs to be avoided by making sure that the pests are not there in the first place. By allowing the raccoons to inhabit your compound for long, you also increase the chances of members of the household acquiring parasitic diseases. Most raccoons are heavily infested with various parasites, and they may pass stool that contain their eggs. When your kids come into contact with them and ingest them, they may end up getting the infection. In addition to that, the stool may also contaminate your food (such as that which is in the garden), and you can then get the infection through this route. The other major Raccoon problem is not to let Raccoons stay in your compound for too long. Once Raccoons choose your property, is the chance of structural damage to your home. For instance, if they have access to the attic, they have the potential of tearing things up in the process of making a nest for themselves. The same can also occur in any other part of the home as long as they have access to it. As you can imagine, this is something that will cost you a lot of money to repair, and simply putting in place measures to keep them out of the property is usually more than enough to keep them at bay. The raccoons don’t cause harm to pets only; the presence of other animals in the compound can also be affected by the presence of the pests. If you happen to be a farmer, for instance, the presence of raccoons can quickly drive you into a loss. They have the potential to attack fowl and kill them, as well as kill their eggs. This is why fowl farmers need to be extremely vigilant and get raccoon removal services whenever it is necessary. Other animals that might be adversely affected by the presence of the raccoons include turtles, whose eggs the raccoons might end up eating. As you can see, there are many compelling reasons for you to reduce the presence of raccoons in your compound. If you are thinking of doing this, it’s a good idea to take the right approach in keeping them at bay. This usually means not only getting rid of them to solve the Raccoon problem, but also Wildlife prevention on areas weak to Raccoon entry. Consulting a respectable animal removal expert is the best way to do this!